Delivering the best customer experience possible is one of our key tenants here at Billy Casper Golf. We are committed to making every experience at our courses an award winning one. As we move into 2015 we'd like to take a moment to reflect on the Awards and Nominations that our courses and staff received in 2014. ★ Fernandina Beach Golf Club was designated as an Audubon Cooperative Sanctuary in March 2014. ★ The pride that the staff at Hiddenbrooke Golf Club takes in providing an amazing golf course, first class banquet facilities, and outstanding customer service resulted in them receiving the 2015 Local’s Choice Award from Local Happenings Magazine. ★ Sun 'N Lake’s always friendly staff, tasty food, and great course took home three awards in the annual “Highlands Today” Best of Vote; Best Golf Course, Best Golf Shop, and Best “Early Bird Special” Restaurant. ★ The Country Club of Woodbridge is great place to play a relaxing game and a beautiful public course, this year they were runner up for Best Public Course by New Haven Living. They are determined to win the whole shebang next year. ★ Flanders Valley, one of the premier public courses in the US, was recognized by the New Jersey General Assembly as the Best Golf Course in Morris County for 2014 by the Daily Record. ★ Located in Cape Cod for the last 50 years, Falmouth Country Club is the definition of golf tradition. In Cape Cod Life Magazine’s Best of Cape Cod Awards Falmouth won the Silver for Best Golf Course on the Upper Cape. ★ Not only is Whittle Springs Golf Course Knoxville’s first public golf course it’s a local favorite, winning the 2014 News Sentinel Reader Choice Award. ★ Cypress Creek Country Club, Robert Von Hagge’s first creation in FL was voted Best Golf Course by the readers of the Boynton Beach Forum. Their restaurant, Trushots Bar and Grill also received the award for Best American Cuisine in the same awards. 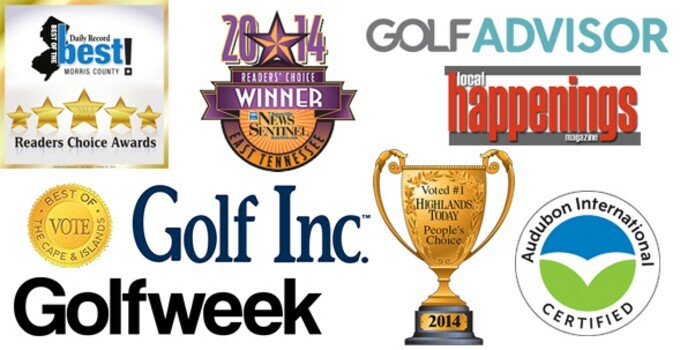 ★ Nominated for Young Business Leader of the Year for the Amelia Island Fernandina Beach Yulee Chamber of Commerce in 2014 - Josh O’Brien at Fernandina Beach Golf Club. ★ Our very own Megan Bell at Sun 'N Lake was Voted the Number One Wedding Planner in Highland County in the annual “Highlands Today” Best of Vote. ★ USA-golf.com ranked Wintonbury Hills Golf Course as the #6 Municipal Golf Course in the USA, Golfweek ranked them the #11 Municipal Golf Course in the USA, and USA Golf week recognized them as the #2 Golf Course in CT.
★ Located in the heart of the Pocono Mountains is Jack Frost National, this gem was on two national lists this year and one state list. Reaching #17 on Golf Advisors top 100 courses in the US, #24 on Golf Advisors top 100 conditioned courses, and #14 on Golf Magazines "best public course in the state”, Jack Frost National is truly a treat in the mountains. ★ In the June 2014 edition of Golf Magazine Sunset Valley, Pompton Plains, NJ was listed besides Spyglass Hill Golf Course, Pebble Beach, California; The Boulders Resort (South), Carefree, Arizona; Whistling Straits (Straits), Haven, Wisconsin as one of the four courses to play at twilight. ★ Billy Casper Golf’s CEO Peter Hill was honored by Golf Inc. magazine, ranking him sixth on their list of the Most Powerful in Golf.